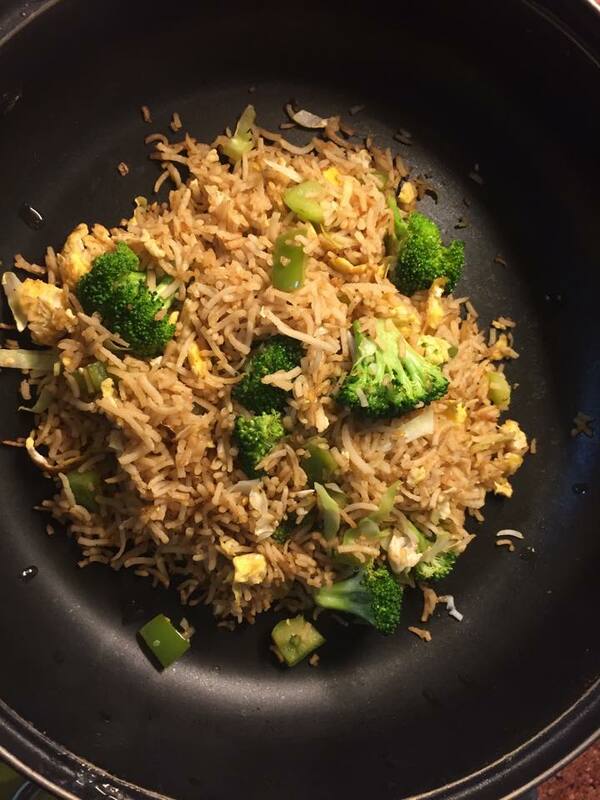 Are you crazy about fried rice too? If you follow me on social media, you would have seen me lament about the lack of good quality fried rice in the Chinese restaurants that I call in from in Mumbai's Bandra west. At such moments I wish that my favourite restaurant in Mumbai, Ling's Pavilion, was closer to home than it is at Colaba! Well, I did address my angst last weekend. We had gone to Ling's Pavilion for dinner as Bunkin Banu was on a bunking spree. We had a fabulous roast chilli garlic pork, steamed ginger and spring onion pomfret (half portion but on the bone) and prawn pan fried noodles (a bit soupier than normal) at Ling's and co-owner Nini Ling sent us some 'jumping prawns'. I then packed a small portion (Rs 320 plus taxes) of mix meat fried rice which made for a fantastic Sunday lunch alongside with some left over pork. I had never been so happy on a Sunday in Bandra. Oh, one more thing. You can now cross over from Ling's after your meal and go to Le 15 Cafe for our favourite dark chocolate macarons. But I digress. At the risk of sounding vain, the Ling's Pavilion fried rice is the only fried rice that I really like apart from the one I make for myself! They also have pot rice and stuff at Ling's but I prefer the good old fried rice. I used to go for the bacon one at Ling's till my friend, former food critic, film maker and fellow probashi Bengali, Soumik Sen pointed me to the mixed meat fried rice at Ling's which is indeed pretty celestial. What I like about the Ling's fried rice is that it has got just the right amount of flavour from the sauces and meat in it which makes it so appealing and complete. Let me explain my love for fried rice. I was a fussy eater when I was a child and my mother would have to specially cook for me. One of the dishes in her special 'pampered only child (till my brother was born) menu' was fried rice. Going out to eat became very rare after my father passed away. The occasional treat my mother would take us out for in Calcutta would be for Chinese food. The menu would be constant. Chilli chicken, prawn balls, mixed Hakka noodles and mixed fried rice. Mom told us that fried rice was apparently special occasion food for the Chinese just like pulao is for us and that on regular days the Chinese apparently ate plain and soggy rice which we wouldn't like. Info she had picked up from her time in the UK in the mid 70s. My mom had invited friends from school over for my last birthday before we passed out and made fried rice and noodles and chilli chicken which my friends spoke about for a while. Soon after that I went to Digha with my grandparents for a holiday. Digha is a seaside town close to Calcutta. There was nothing to do and I finished reading Gone With The Wind in 4 the 4 days that Inwas there. We were at a guest house where my granny would cook. At nights I would go to have dinner at a beard hotel for variety. I would have fried rice. Served with tomato sauce! 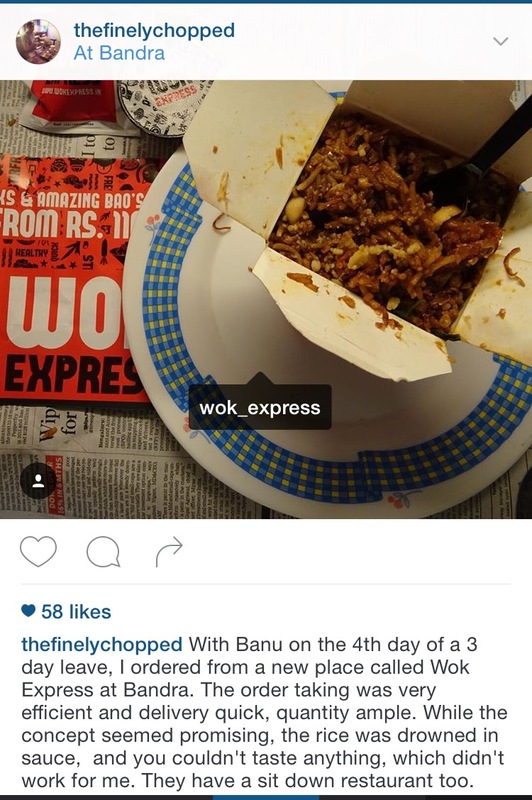 The Chinese fried rice was on its way to becoming as Bengali as the mishti Basonti pulao by the early 1990s. Fried rice played a big part of college day eats paid for with money scrounged from travel allowances that I got from mom. My classmates and I used to go to a small, non-airconditioned place called Tasty outside the India Coffee House from Presidency for fried rice. The only thing I remember was they used to give forks (!) alongside the fried rice which cost less than Rs 20 (mid 1990s). One day I plan to go and revisit my college day eateries when I go back to Calcutta. The other place whose fried rice I remember from those days was the then newly opened, and now shut possibly, New Market outpost of Kala Mandir's Jimmy's Kitchen. I used to eat the ham fried rice there which would be coupled with movie outings at New Empire or Lighthouse or Jamuna or Globe. I think only New Empire survives now from the lot now and I doubt if it is any longer considered posh in today's era of multiplexes. The thing about the Calcutta's Chinese fried rice was that, from what I remember, it used to be flavoured with soy sauce and meats which would make it a one dish meal which two people could share. You didn't need a side dish with it. Nifty when you are young, hungry and on a budget. This is what I have also observed the fried rice in Chinese eateries across the world in places such Zurich, Penang, Langkawi, KL, Sydney, Melbourne, London and Singapore though I confess that I have not been to China. Yet. Things were different when I came to Mumbai to work in the late 1990s. Here, I noticed that the fried rice served in most restaurants were virgin white and had not been, er, consummated with the touch of flavour. The fried rices that I came across here were pretty tasteless actually which forced you to order a side dish along with them. The portions of rice were larger in Mumbai than Calcutta and was more expensive too. In fact some restaurants in Calcutta offered half plate options then. The chicken or prawn in the rice in Mumbai was usually without any taste and often chewy and tasted like soggy cardboard. While a lot of the Calcutta Chinese restaurants that I used to go to had some third or fourth immigrant Chinese connection, the ones in Mumbai were owned by locals. I remember once having a crab fried rice at Mainland China where one just couldn't spot the crab or detect its taste. This was typical of fried rices in Indian run restaurants in Mumbai. Mumbai is where I came across something called Schezwan rice which I hadn't seen in Calcutta when I left the city. It was lurid red in colour and spicy I assume. My in laws loved it but I would never touch it. Coming back to the present, there are times when I felt like fried rice for dinner, wasn't up to cooking and wanted to order it (call in) home in Bandra. The rices I would call for would disappoint every time. In the olden days we used to call from Tiffin at Pali Naka. The burnt chilli rice at 5 Spice is tasty but ludicrously oily. The one at Mr Chow's is white again and sans flavour. I recently tried Wok Express where the rice was drowned in sauce like Khar Subway is during the rains. The Ling's Pavilion fried rice on the other hand can act as a complete one dish meal too. For all their 'authentic' Cantonese touch, they use Basmati and not sticky rice for their fried rice at Ling's though. This works for my Indian palate as I don't like sticky rice. As Baba Ling of Ling's once said, Indians would think they were shortchanged if he didn't use Basmati. He speaks from experience I am sure. There are two places in Mumbai that I have come across which use sticky rice in fried rice. 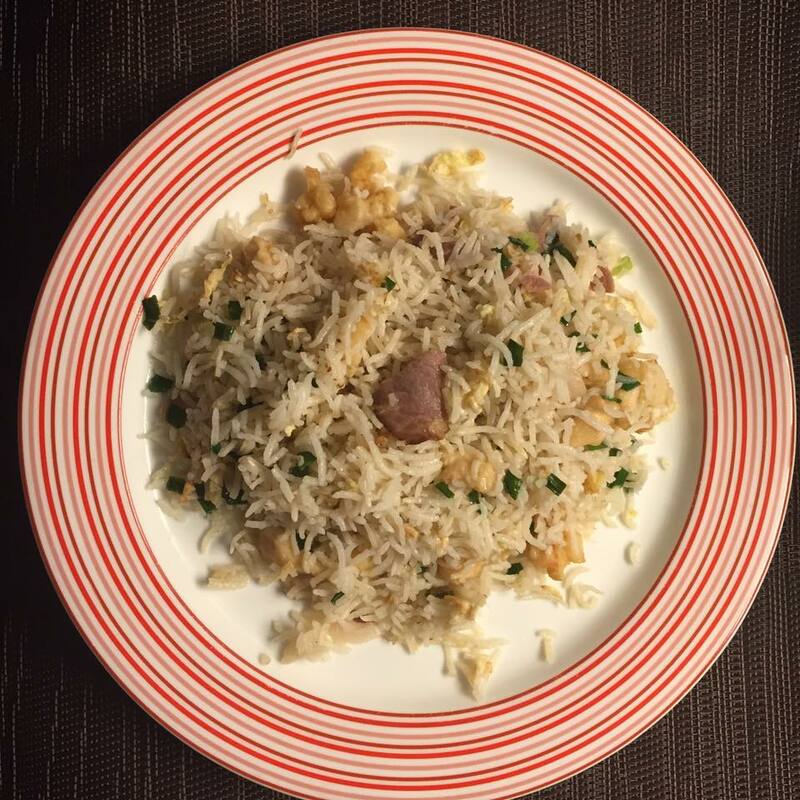 One is Manu Chandra's Fatty Bao which makes this excellent bacon fried rice with sticky rice and English bacon. Pair this with their divine double cooked pork belly (Sri Lankan pork I think). I must check if they deliver as they are in Bandra. The thought of the crowds there deter us from going to the restaurant. Then there is Chef Liang's Pan Asian at ITC Maratha in Andheri East. Chef Liang breaks into a smile and tosses up and serves me a mind blowing double cooked pork belly every time he sees me. He uses imported pork too unlike in Ling's Pavilion. They do great stuff with local pork at Ling's thanks to having invested in their suppliers over the years. Last time I was at Pan Asian, Chef Liang made me a nice egg fried rice with sushi rice to go with the pork. Pan Asian can get expensive of course as it is a five star restaurant. The quality at Pan Asian is superb though and it probably is my favourite ITC Hotels restaurant though Ottimo in ITC Gardenia and West View at ITC Sonar would give stiff competition. Soumik told me about China Valley recently. It's a delivery only place in Bandra. When I instagrammed about it, I found it that it has quite a few loyalists and has sit down restaurants too in Prabhadevi and Powai. Soumik recommended the bacon fried rice and mixed meat rice at China Valley. Both were pretty good and didn't skimp on flavour and the meat and prawns on the rice were so brilliantly juicy. I once ordered the mixed meat rice from China Valley and got some bacon added in and had this as a one dish meal. The cost is less than Rs 300 and can feed three. Their number to call in Bandra is 022 65513333 and they store your address after the first time and the delivery is fast and efficient. Their pork dishes are well recommended in social media though the China Valley Bandra menu doesn't mention pork. I ordered the chilli pork the first time I called from China Valley. The pork was cooked well and the meat was good. It was as spicy as a Kolhapuri mutton though and literally brought tears to my eyes and made me sweat. The high spice levels are possibly because the owner is Maharashtrian. Another place which makes a good fried rice in Mumbai is the Royal Bombay Yacht Club but for that you need our Jamshed Uncle to invite you. I hope to go to China someday and try out the 'fried rice there. If the dish actually exists! Try the recipe and tell me how you find my fried rice. You won't need a side dish with it. Just some finely chopped green chillies in soya sauce dip to go with it. I am total rice fan, specially 'phyana bhaat'!!! I love to eat fried rice with gobi manchurian.